Los Angeles Lakers Fire Coach Mike Brown Five Games Into The Season : The Two-Way The Lakers finished 41-25, last season, but were eliminated in the second round of the playoffs. The team started off the season with a disappointing 1-4 record. 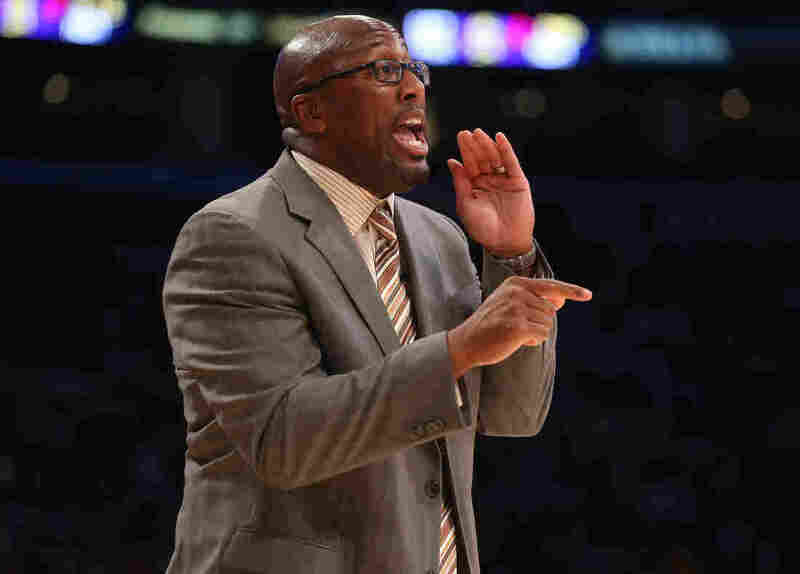 Former head coach Mike Brown of the Los Angeles Lakers gives instructions during the game against the Los Angeles Clippers in November. The Los Angeles Lakers have fired coach Mike Brown only five games into the season. In a press release, the Lakers said Assistant Coach Bernie Bickerstaff will take over in the interim. "This was a difficult and painful decision to make," the teams general manager Mitch Kupchak said in a statement. "Mike was very hard-working and dedicated, but we felt it was in the best interest of the team to make a change at this time. We appreciate Mike's efforts and contributions and wish him and his family the best of luck." "It was believed to be the earliest firing of a coach in the team's history. Del Harris was relieved of his duties 12 games into the 1999 season. "The Lakers were 41-25 in Brown's first season, losing to Oklahoma City in the second round of the playoffs. "The team has had trouble picking up Brown's Princeton-based offense and has also lagged defensively." The Lakers are 1-4 this season. ESPN reports that the move is in keeping with a "win now" mentality, which was also responsible for the high-profile acquisition of Steve Nash and Dwight Howard. "The Lakers are off to the worst start in the Western Conference despite carrying the league's largest payroll at just over $100 million, which would trigger an estimated luxury-tax bill at season's end of nearly $30 million," ESPN reports.